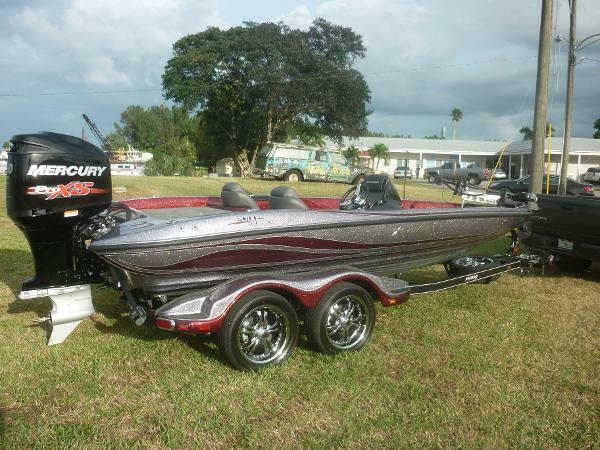 2017 Stratos 201 XLE MOTOR IS MERCURY 250 PRO XS BOAT:INSIDE DECK: RED MISTTOP DECK: SILVER ANNIV MISTDECK STRIPE: RED MISTDECK PINS: ECLIPSE MISTCONSOLE: RED MISTHULL BOTTOM: JET BLACKSIDE PANEL: SILVER ANNIV MISTHULL STRIPE: RED MISTHULL PINS: ECLIPSE MIST UPHOLSTERY: SEAT MAIN: DARK GRAPHITESEAT ACCENT: RED DSEAT CENTER HR: STORM/METEOR D TRAILER:CARPETFENDER: SILVER ANNIV MISTFENDER TRIM: RED MISTFENDER PIN: ECLIPSE MIST INCLUDES DUAL CONSOLE, REMOTE DRAIN OPTION, OIL FILL REMOTE, LOWRANCE HDS9T-G3, LOWRANCE HDS9T-G3, 15AMP X 4BANK CHARGER, MINN KOTA FORTREX 112 45" 36V, BATTERY HOLDER 36V, BLACK ROPE RATCHET COVER, STAINLESS PROP, WHEEL UPGRADE, ALUM SPARE TIRE! 2016 Stratos 201 XLE, 2016 Stratos 201 XLE - PSS01181I5162016 Evinrude 250HGL E-TEC - 054410652016 Stratos Tandem Axle Trailer - 567SSBN26GF086340When you were thinking about your ideal bass boat we were already building it. Rich in performance and features. Affordable when it comes to price.With out-performance built-in, the 201XLE Evolution is the most sleek and versatile bass boat on the market. Experience the confidence of 100 percent composite construction and a race-honed Stinson hull with 250 horses of available factory-rigged power. PLEASE ASK ABOUT THE AVAILABILITY OF NO MONEY DOWN FINANCING!!! !INCLUDED OPTIONS - Remote Drain Plug - - Lowrance HDS- 9 at Console - - Lowrance Structure Scan - - Lowrance Point 1 Antenna - - Lowrance HDS- 9 on the Bow- - Lowrance Ethernet Cable - - MinnKota Fortrex 112, US2, 45', 36V -- Batteries, Tray, Holders - 3 - Spare Tire -- Trolling Motor Support Stand @ Bow - - Step Up Platform on Trailer - SPECIFICATIONS- Overall Hull Length- 20'7'- Beam w/o Rubrail - 96'- Beam w/Rubrail - 97 1/2'- Maximum HP - 250- Engine Shaft Length - 20'- Inside Depth - 22'- Total Persons, Motor, Gear (lbs) - 1400- Approx. 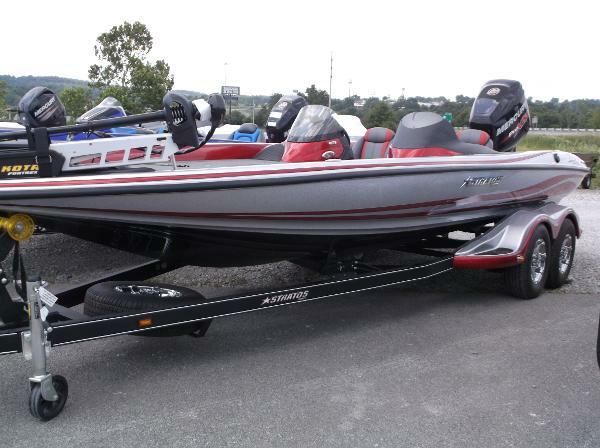 Boat Weight (lbs) - Single Console - 1800- Approx. 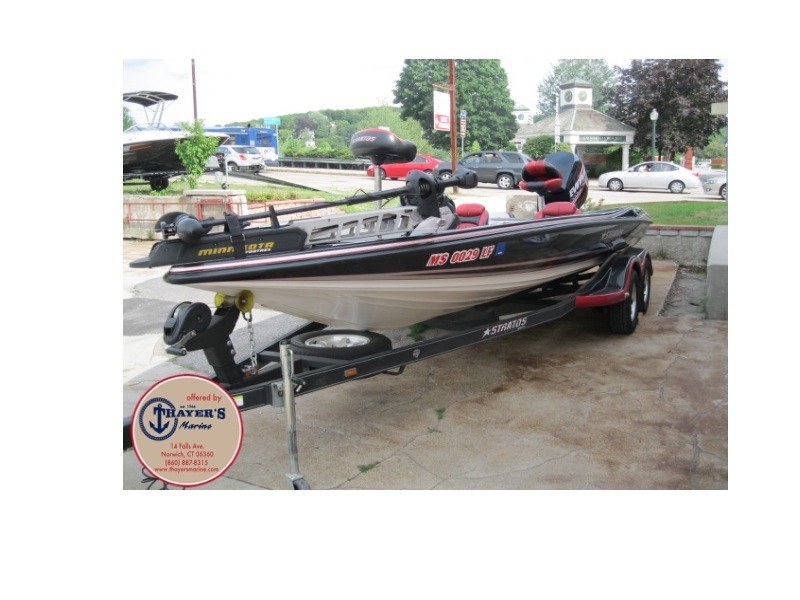 Boat Weight (lbs) - Dual Console - 1850- Fuel Capacity- 47 Gallons- Three generations of boating know-how make Thayer's Marine, Inc. your leader for everything boating. With over 100 years of boating experience, we have learned what works, what doesn't, and pioneered what will. Our sales department works to find you the boat of your dreams, our parts department helps get you back on the water, and our service department fixes those problems you cannot, the first time. Oh, and CSI scores in the upper 95 percentile to back it all up. 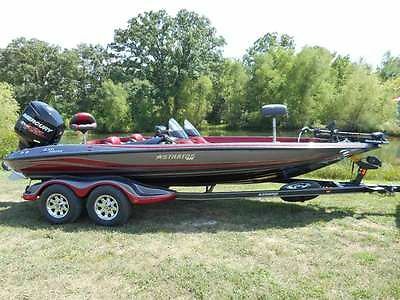 2009 Stratos 201 XLE Evolution, 2009 Stratos 201 XLE Evolution - GSN12923J8092009 Evinrude 250HP - 52264102009 Stratos Trailer - 5K6SB222X92082900- Description -With out-performance built-in, the 201XLE Evolution is the baddest, bass rocket yet. Experience the confidence of 100 percent composite construction and a race-honed Stinson hull with 250 horses of available factory-rigged power. Inside, giant 8' rod boxes line both sides of the huge front deck. Lockable storage is everywhere and the inclusion of an extra tackle management system under the center front lid is one more reminder that this machine is built to take all comers. Center stage, the attitude continues with jaw-dropping custom seats and cockpit instrumentation so hot it could boil water. Combined with a 40 gallon aerated acrylic livewell this is the 201 Evo. Everything else is second best.Please ask about the availability of NO MONEY DOWN FINANCING! 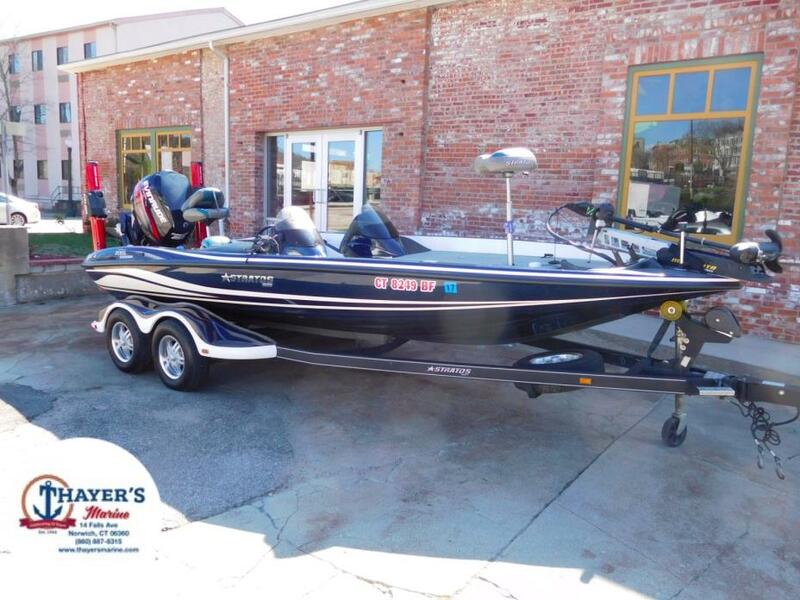 - Included Options -- Stratos Travel Cover- MinnKota Fortrex 101 #, 36V- TH Marine Trolling Motor Pull Handle- Rod Buckles - Ram Mount @ Bow- Hot Foot- Raker II Stainless Steel Prop - Spare Tire- Fulton XLT Series Winch- Keel Guard- Pro Trim & Tilt @ Console - Fiberglass Trailer Fenders - Humminbird 767 Fish Finder GPS @ Console - Compression Test -1: 120 2: 1123: 1154: 1125: 1156: 115Three generations of boating know-how make Thayer's Marine, Inc. your leader for everything boating. With over 100 years of boating experience, we have learned what works, what doesn't, and pioneered what will. Our sales department works to find you the boat of your dreams, our parts department helps get you back on the water, and our service department fixes those problems you cannot, the first time. Oh, and CSI scores in the upper 95 percentile to back it all up. 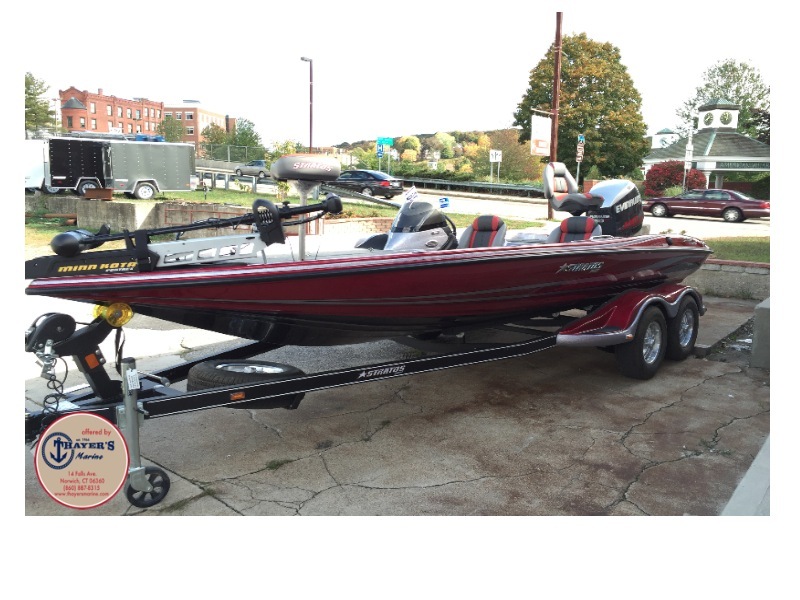 WEST PLAINS MARINE IS YOUR FULL LINE, CERTIFIED, MARINE AND POWERSPORTS DEALER.THIS IS OUR STRATOS DEMO UNIT AND YOU WILL PURCHASE IT AS A NEW UNIT WITH FULL WARRANTY WITH OUT THE NEW PRICE. 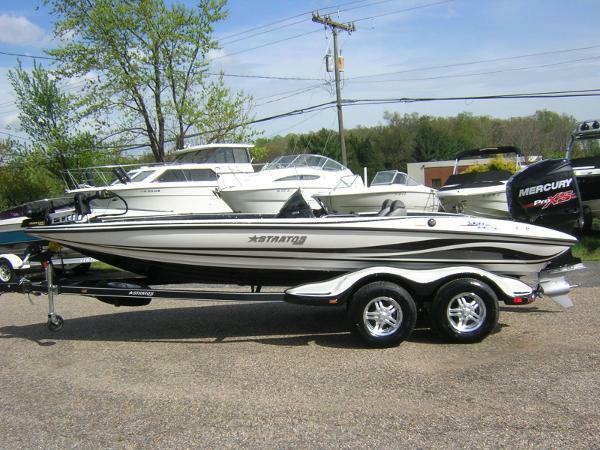 MSRP ON THIS BOAT IS $65,995 WITH ALL THE OPTIONS, BUT YOU PAY THE DEMO PRICE OF $52995WE OFFER GREAT FINANCING AND DELIVERY 24/7 http://www.westplainsmarine.net/financeapp.asp VISIT OUR WEBSITE WWW.WESTPLAINSMARINE.NET 2014 STRATOS 201 XL EVOLUTION-FULL LIMITED LIFETIME WARRANTY 2014 MERCURY 250 OPTIMAX PRO XS-5 YEAR MERCURY WARRANTY 2014 STRATOS TRAILER-TANDEM AXLE W/ BRAKES 201 BASS ANNIVERSARY EDITION DUAL CONSOLE 20'9" IN OVERALL HULL LENGTH 96" BEAM 46 GAL FUEL TANK PORT ROD BOX LENGTH 8' CENTER ROD BOX LENGTH 7'6" CNETER STEP COOLER LOTS OF TACKLE STORAGE BLUE WATER LED LIGHTS AND BLACKLIGHTS MOTORGUIDE DIGITAL 36V SPOTLIGHT SCAN REMOTE DRAIN PLUG FOOT THROTTLE JACKPLATE LOWRANCE HDS 7 IN CONSOLE LOWRANCE HDS 9T XL RAM IN CONSOLE LOWRANCE STRUCTURE SCAN W/ SIDE IMAGING LOWRANCE HDS 7 IN BOW RAM MOUNT MINNKOTA PRECISION BATTERY CHARGER 3 OPTIMA BATTERIES BENCH SEAT INSERT CUSTOM BOAT COVER FURY STAINLESS STEEL PROP ALUMINUM WHEELS SPARE TIRE AND WHEEL VISIT OUR WEBSITE WWW.WESTPLAINSMARINE.NET CALL US DIRECT FOR MORE QUESTIONS, DELIVERY OPTIONS, AND FINANCING417-255-0963 THIS UNIT IS IN OUR SHOWROOM FOR SALE AND WE RESERVE THE RIGHT TO END THIS AUCTION AT ANYTIME.